With Atari800MacX not fully functional with macOS Sierra and with no guarantees that it ever will be, I decided to make a Wine port of Altirra 2.80. It seems to function just fine. The sound works, USB joysticks work, and the frame rate seems fine so I'm going to start to use it. Hopefully Phaeron is ok with that. If not, please let me know and I will take it down immediately. I hope this helps my fellow Mac users until a native solution appears. I've used Altirra under Wine for about a year. Everything works just fine. I know it doesn't have a native OS X interface but, in this case, that's ok for me with how often Avery updates it. Thanks, downloading. I have both Mac and Windows so it will be nice to have Altirra on Mac as well. Never really been much of a fan of Atari800MacX. I also have both systems and appreciate very much your work. Thank you! Hi Pete; thanks very much for sharing the Altirra/Wineskin file. VERY much appreciated. -Mike. Not working for me under Sierra The Altirra icon bumps up and down in the dock the disappear and nothing is running. I've updated the Wine port to Altirra 2.9. Seems to work ok for me. Let me know if you have any issues. Works like a champ for me under Mac OS Sierra 10.12.6. Thank you. I´ve installed Altirra without bottling it, because I use it in combination with eclipse (WUDSN). But for me, Debugging doesn´t work. You´re package looks good, also debugging works, but how can I call it from eclipse? My method using a shell-file doesn´t work with your package. Works for me under 10.12.6. Thank you very much! Working for me also on 10.12.6 !. Thanks that rulez! Got it working, simpply had to place my shell-script in altirra.app/Contents/Resources/wineprefix/drive_c/winebottler/ and point to it in Eclipse. Thanks for your work. Edited by skr, Wed Sep 20, 2017 3:26 AM. Updated the file to Altirra 3.0. Simply replace the exe files from the new version. Works fine! Oh, boy. This file is extremely large. Just use the link for version 2.9 and copy the files Altirra.exe and Altirra64.exe (from the regular Altirra 3.0 distribution) to Contents/Resources/wineprefix/drive_c/winebottler. Overwrite the existing two files. It's simple like that. Don't forget the delete the corresponding Wine-folder in ~/Library/Application Support otherwise you won't see version 3.0 starting (on my system the folder is called "_1503363707767"), it's created again on that place after you started the file again. Ah ok, didn't know it was an updated dropbox link.. Thank you Stargunner, I love you! Sierra 10.12.6.
to my mind, we are very close to have an emulator for the Mac users in a Ready to doubleclick version without having Wine installed! Giga thanks to Phaeron for his fantastic and outstanding emulator. :-))) The community can't thank you enough, really! Sadly, I am just a wannabe Padawan and therefore my IQ is not high enough to solve the last remaining question on how to transfer from WUDSN directly to Altirra? 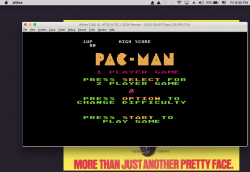 The script to the Atari800MacX emulator works fine from WUDSN for years. Altirra is a little bit different, as described before. has to be adapted. But how? Please don't missunderstand, I don't want to have a version which runs on my Mac, I want to have a version which runs on all Macs, just doubleclick, no Wine installed. Thanks again Fletch for posting an updated version with 2.9; Very much appreciated. Mike. 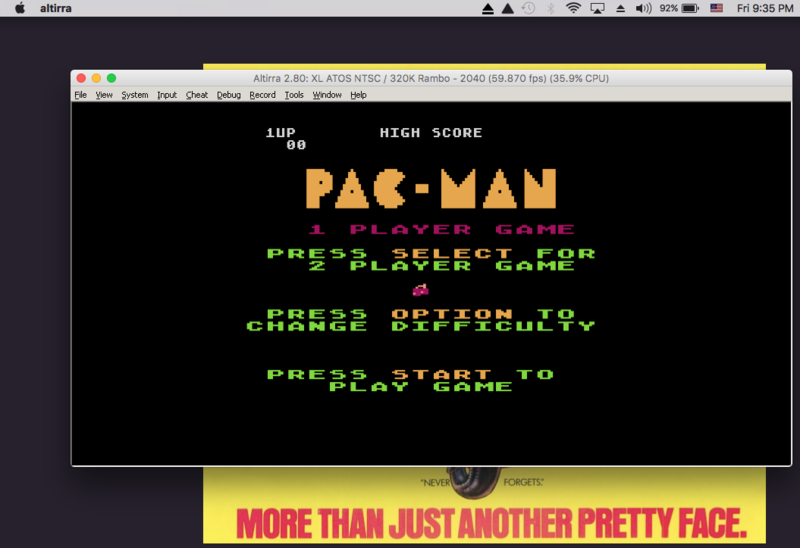 In the spirit of sharing experiences getting Atari emulators running under OSX. I have Atari800 running nativley under OSX High Sierra (10.13.6) with full audio using these instructions on a thread elsewhere here. Like Jack, I also use Play On for Altirra now. 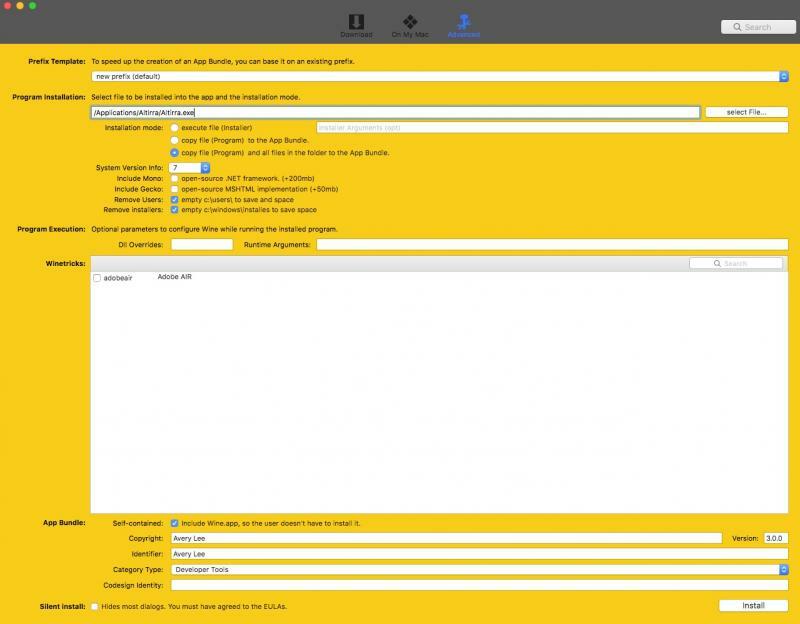 Although, as Mt Robot says in his post linked to by Jack, if you have Homebrew installed (if not, why not? ), it's easy enough to get atari800.